The early history of the village is not easy to trace. Some Roman and earlier artefacts have been found in the area and there was a Romano-British burial site on Firgo farm. Records indicate that Harewood Forest was part of one of the Royal Forests in late Saxon times. All rights of chase were reserved to the King and any felling was strictly regulated. The Normans reinforced these Forest Laws and until the Charta de Foresta of 1217 land could not be enclosed or cultivated, nor game taken or timber felled. A Royal Enquiry of 1295 allowed the Abbess of Wherwell to cut down timber in Harewood. 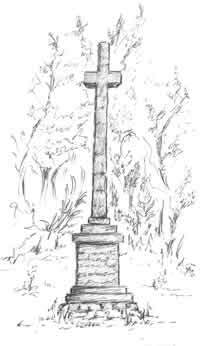 A monument called Dead Mans Plack in Harewood Forest, erected in 1826 by Col. Iremonger, commemorates a colourful episode, but, alas, one which historians now think is apocryphal. It recalls the murder of Earl Aethelwold by King Edgar in 963, after the earl had himself married the bride, Aelfrida, whom the king had asked him to woo on the royal behalf. What is true is that Aelfrida subsequently married the king and after his death retired to the Benedictine Abbey of Wherwell which she may have founded in c.986 on land given to her by the king. The Abbey was wealthy and evidence from its cartulary shows that the tithings which came to form Longparish were owned by the Abbey. The only one listed in Domesday Book is Middeltune, which it says was always held by the Abbey. Two mills are mentioned, as well as land for nine ploughs, a fishery for the use of the hall and nine acres of meadow. For most of its history the economy of the village has been based on farming, milling and fishing. The church is the only building which can confidently be dated before the sixteenth century, although some of the cottages may be older than has been thought hitherto. When the Abbey of Wherwell was dissolved in 1539 by Henry VIII, most of its estates, including Longparish, were granted to Thomas West, Lord de la Warre, and subsequently bought in 1695 by Edward Boulter of London. He almost immediately sold his Longparish estates in 1698 to Richard Widmore of North Oakley whose family or their trustees owned Middleton House until it was sold to William Whitely, later Lord Marchamley, in 1912. There are several memorials in the church to the Widmores, and Richard Widmore perpetuated his name by establishing a small charity, which was wound up in 1998. The population of Longparish according to the 1991 census was 730. When the first census was taken in 1801 the population was 558. It rose to 875 in 1851, but dropped somewhat to 729 in 1911. There has not, therefore, been a great change in numbers since the 19th century, but there are now considerably more households with fewer occupants. In the 18th century Longparish was regarded as a poor village with about 500 residents. The majority were employed in agriculture, either as labourers or as associated craftsmen. In 1789 the Rev. Iremonger produced figures to show that the income of a Longparish man with two small children was £20 16s, whereas unavoidable expenses were £23 1s 9d. The village was affected by the agricultural labourers riots in the early 1830s, and wages were then improved.